Today's So-Saree Reader is my dearest childhood friend Payal. We went to the same playschool and high school too. Our mom's were friends too, and we had so much fun together. We grew up..! And got busy with our lives. But then good things happened sometime later..
And I am glad all my friends are reading it and and enjoying it as much. So, to ease some burden off me from the month long blogathon, I asked my dear friend to do a guest post, and she did so well. I am so happy to have asked her. Go ahead and read what Payal has to say. 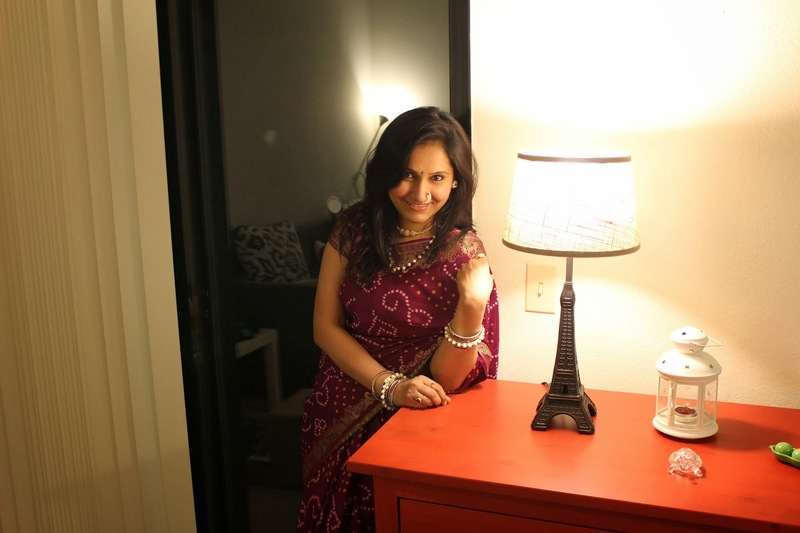 I must admit that I was never really a huge saree person. Wore it only for the occasional weddings in the family or on some special days at work. But then last year, marriage happened and my life took a sudden turn! Now here I was, on my wedding day, going through the whole shaadi drill with 5 saree changes (and a lehenga to add to that) in a single day! It didn't seem too much of a hassle though because I had my personal stylist and my friends to help me deal with the ordeal. But this was only half the fun. More majja happened post marriage when I had to drape a saree for every other occasion right from a pooja to a visit to the temple or a relative's place or some festival. No one really forced me into it but looking at my wedding pictures and seeing how pretty and elegant (self-praise alert!) I looked in a saree, I made it a point to wear a saree at least for the special times. It made my husband also very happy *wink wink* I think it's got something to do with Indian men and their psyche. They absolutely love seeing their wives (I am hoping only their wives!) wrapped sexily in a saree. I never had a problem draping a saree back in India because I always had my mom or my sister or my sasuma or some aunty coming to my rescue always! The real fun began when I moved to California with my husband. With my whole life packed in two bags, here I was, in a completely different world, setting up a new house, settling in myself, making new friends and trying to make our house a home. 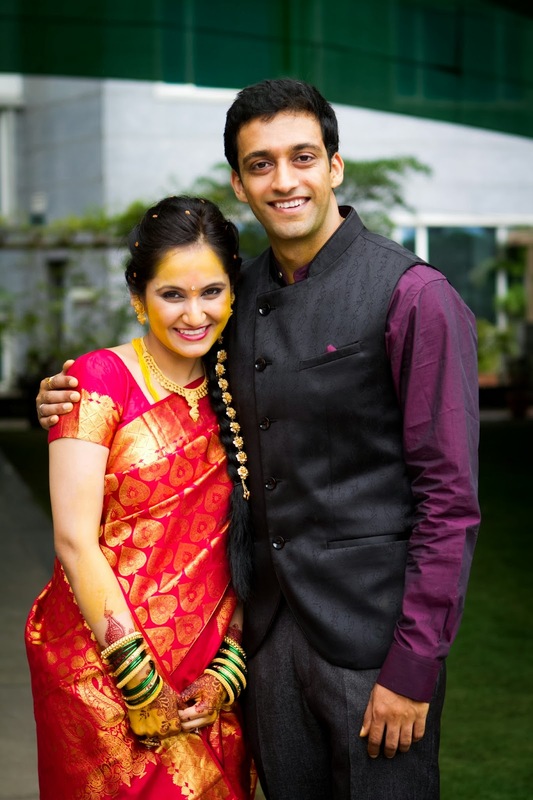 Come November 2013 and it was time for our first Diwali and our first big pooja together. Diwali as a festival has a lot of prominence in Hindu households and especially if you are a newly wed couple. My sasuma sent us faraal, diwali decoration, lantern, rangoli and lots of love and blessings all the way from India. Now we had to live up to that and make it the best diwali of all times for both of us. And so for the pooja, I decided that I had to wear a saree! Yes, an actual 6 yards long piece of garment with no mom or aunty to help! After my marriage date was fixed, my mom(and my brother as well!) had shown me step-by-step how to wear a saree. *Yes, I have a crazy family and I love them to the hilt. * They had made me practice it as well a couple of times but I never really got the hang of it. 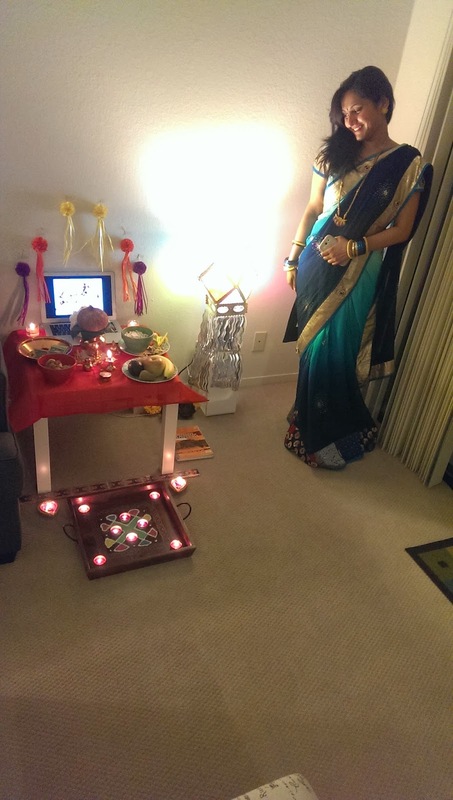 It still brings a smile on my face when I think of Diwali day and how I googled various youtube videos and after several false tries, somehow managed to drape a saree (It did hold it's own I must add) without any help! Correction. My dearest husband did help me with the whole 'process' making it all the more enjoyable and fun. I have definitely made some progress since then and was recently pleased as punch when I managed to drape a saree in my first attempt itself for Makar Sankranti. I won't say it came out perfect but then there's always a next time. I ain't stopping now :) Here's to lots more saree madness and hotness in the times to come! 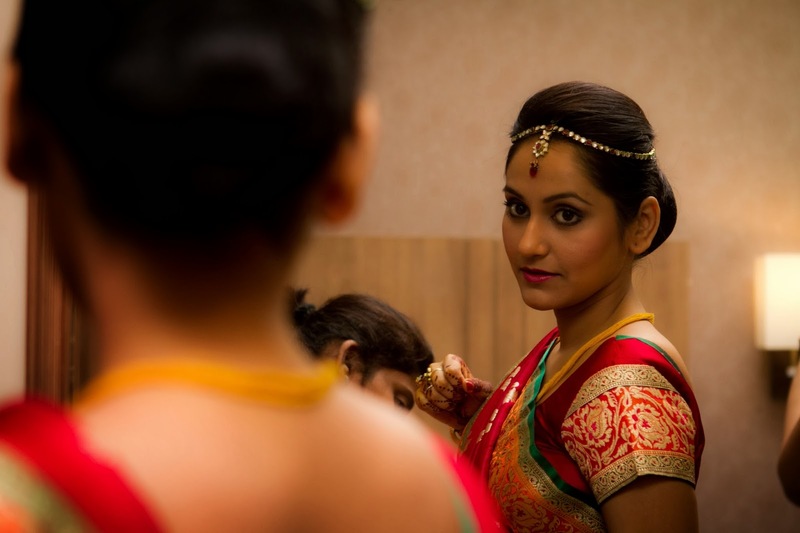 In this post I am sharing a few of my favorite clicks in a saree. Hope you guys like it." My Wedding day, the day when I felt like the queen of the world! That's me on Makar Sankranti. Here's to my slow and steady progress! Majha Navra. My partner-in-crime, my support system, my heartbeat, my everything! Lovely write-up... i enjoyed reading till last.. & yes..the last saree is awesome..with lovely smile! Thank you so much guys for all the love! Appreciated :) Lots of love and success to everyone. 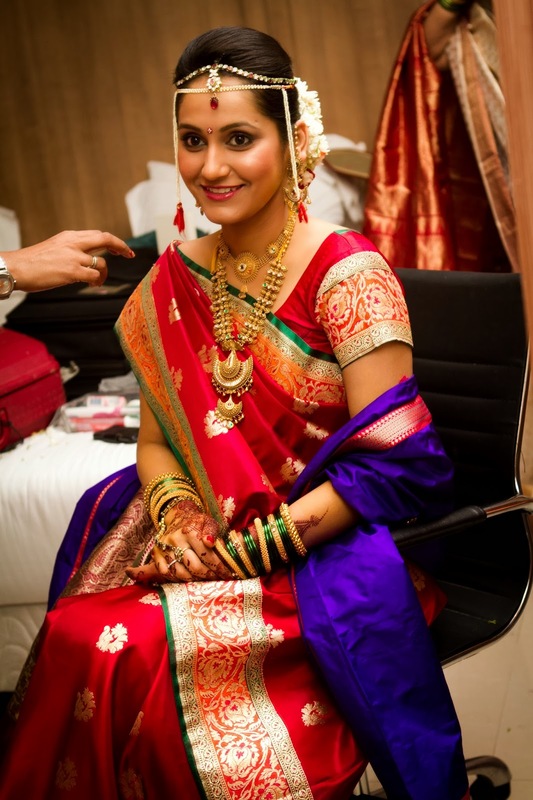 Congrats to Payal, she looks Awesome in designer sarees. Aditi i cnt belive that this is your 1st blog. Images are also excellent, any way congrats to you too. Wow payal,You look so adorable and gorgeous..All the sarees are very nice..lovely pics..